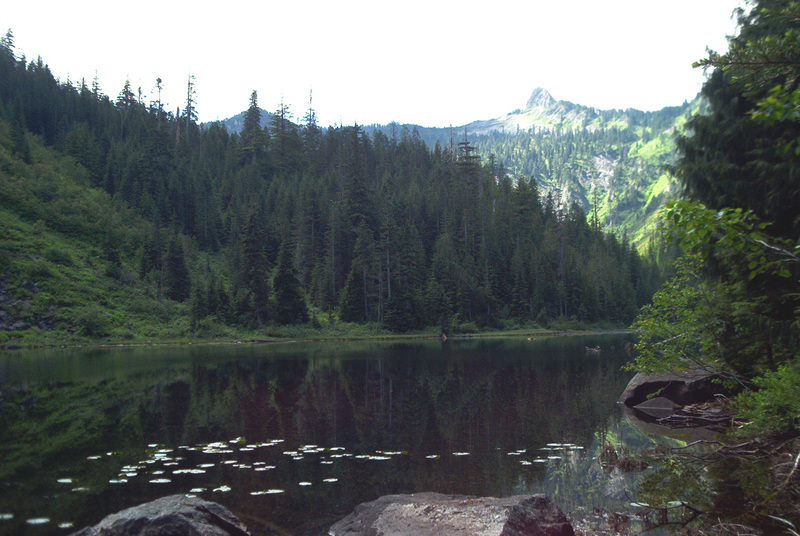 Greider Lake is located in the DNR Morningstar Natural Resources Conservation Area (NRCA). The Greider Lake Landslide splits Greider Lake into two separate lakes, Little Greider Lake and Big Greider Lake. The lake is probably a tarn, which formed during alpine glaciation in this cirque. 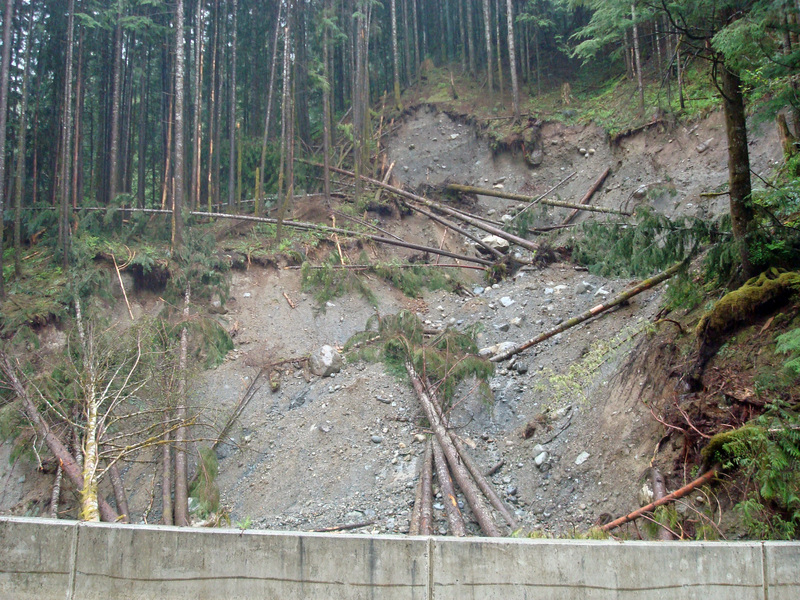 Although it is difficult to determine, the landslide may have moved after the lake was formed. 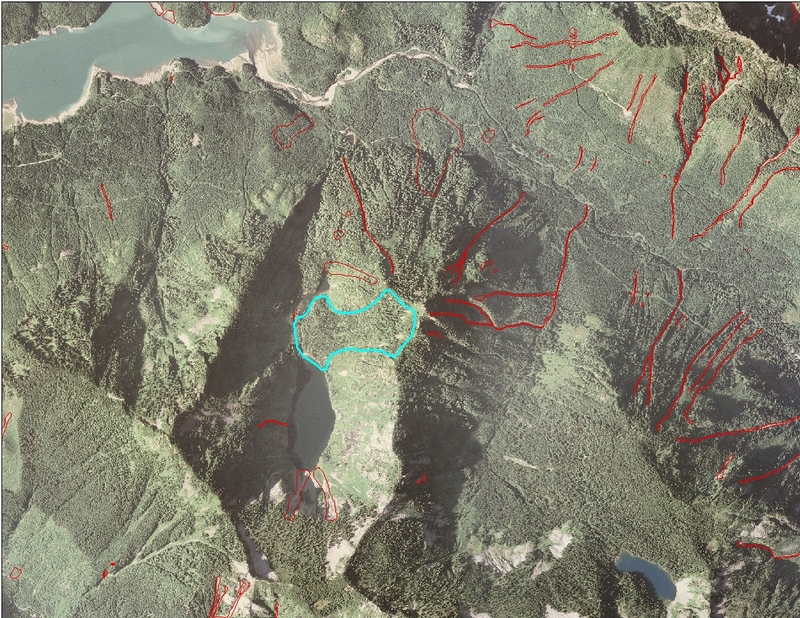 The landslide would have created a large seiche in the lake and probably formed a hyperconcentrated flow or a debris slurry as it moved down hill. The reflection ponds at the base of the hill might be a plunge pool formed by the seiche outwash of Greider Lake. 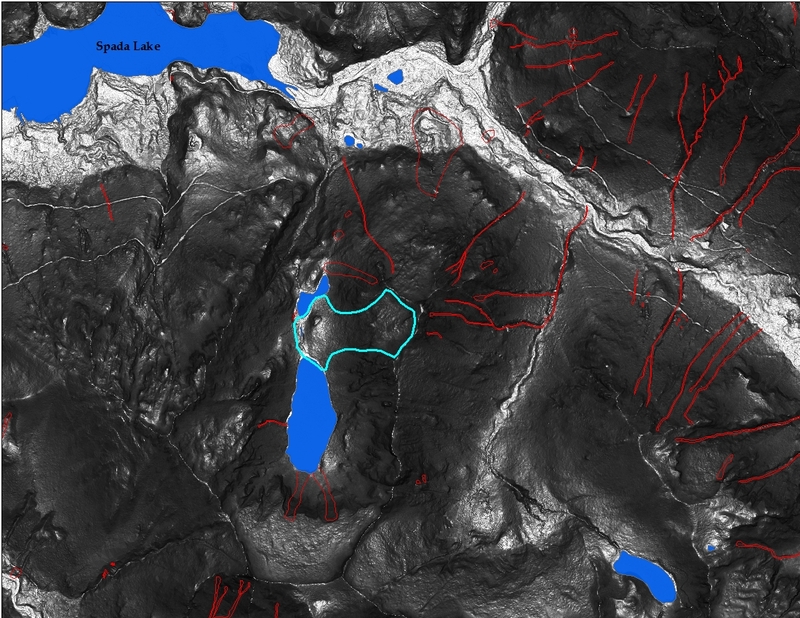 The red lines in the map represent landslides mapped in the Sultan Basin. Glacial lake bed deposits form much of the valley floor where Spade Lake is located. There is a faint terrace that might have been deposited after a debris dam formed from the Greider Lake seiche outwash. Regional bedrock that includes the Sultan Basin watershed belongs to the Western Mélange Belt, part of the Western and Eastern Mélange Belts (WEMB) terrain. The WEMB includes Mesozoic (late Jurassic to early Cretaceous) marine sedimentary rocks, along with lenses of Paleozoic limestones, Mesozoic intrusives, and other rock types in fault-bounded bodies that were tectonically juxtaposed (Tabor et al, 1993). The WEMB rocks underwent high pressure, low temperature metamorphism in the late Cretaceous orogeny at about the time they were juxtaposed against the Northwest Cascade System terrain to the North. Bedrock in the Sultan Basin watershed is mainly composed of the Western and Eastern Mélange Belt (Phipps et al., 2003; Dragovich et al., 2002; Tabor et al., 1993). The oldest units in this watershed are derived from the Stillaguamish Ophiolite (a slice of oceanic crust that has been thrust onto continental crust) suite. Sedimentary rocks were deposited during the late Jurassic to early Cretaceous (170 to 100 million years ago) periods (Carithers and Guard, 1945). The older sedimentary rock formed from thick silt and mud deposited in a marine setting. This unit appears to have had subsequent submarine landslides, resulting in chaotic bedding called mélange (Tabor et al., 1993; Cowan, 1985). Most of the units in the Sultan Basin have been metamorphosed so such features are locally difficult to discern. Younger, continentally derived sediments composed of mostly sand and gravel, of the late Cretaceous and early Paleocene lay unconformably (above a time break in a depositional sequence) on the older rocks (Hedderly-Smith, 1975). Peridotite (dark green to black granite-like rock) intruded around this time into the older marine sedimentary rocks. Hydrothermal systems and submarine eruptions (similar to black smokers) formed from intruding magma, creating large pyritic deposits (such as the Lockwood Pyrite deposit) and overlaid the marine sediment with volcanic (for example, ash and basalt) material (Olson, 1995; Snohomish County, 1979). These rocks were then exposed to regional metamorphism (exposed to heat and pressure). The metamorphism changed the marine sediments into primarily argillite (metamorphosed siltstone), phyllite (metamorphosed mudstone) and chert (white to gray rock) (Yeats, 1964). Sedimentary continental rocks changed primarily into argillite, quartzitic sandstone and meta-conglomerates. Peridotite has metamorphosed into serpentinite (light green to dark green and black dense rock with waxy luster) and talc. This unit was imbricated (thrust as slivers) into the North American plate by an accretionary wedge (Wells and Heller, 1988; Jett, 1986). The timing for this event is not well known, but is constrained to somewhere between early Cretaceous to the early Eocene (Tabor et al., 1993; Frizzell et al., 1987). This was primarily done by faults, many of the faults responsible for this imbrication can still be seen trending northwesterly within the watershed, where they form saddles and linear drainages. Most or all of these faults are no longer active. Severe folding also occurred during imbrication. The Bald Mountain pluton is composed of granodiorite (light gray granitic rock) intruded into the area in the early to mid-Eocene (55 to 49 Ma). Contact metamorphism can be seen near the edges of the pluton and marine metamorphic rock, resulting in gneissic margins (light gray large grained metamorphic rock) (Dungan, 1974; Carithers and Guard, 1945). This unit locally occurs around Bald Mountain and no further outcrops occur to the east. Miocene batholiths (Vesper Peak stock and the Index batholith) intruded into the Stillaguamish Ophiolitic suite. These intrusions are primarily composed of tonalite (light gray granitic rock). The Index batholith caused widespread hydrothermal alteration and metamorphism throughout the ophiolitic units in the Sultan Basin (Baum, 1968). It appears, either a product of weathering or regional intrusive patters, that the southern part of the Sultan Basin experienced higher temperature metamorphism than the northern part, as seen by the minerals at the Sultan King mine and the .45 mine. High temperature minerals, such as magnetite and molybdenite are found at the Sultan King mine. Low temperature minerals are found in the .45 mine, such as galena and ruby silver (Carithers and Guard, 1945). As the batholiths cooled, metal-bearing solutions and subsurface waters flowed into the metamorphic sedimentary rocks, following cracks from the intruding batholiths, sheer zones and faults. As these solutions lost pressure and temperature, they precipitated ore minerals in veins (Carithers and Guard, 1945). Due to the long history within the watershed of faulting, shearing and intrusion, no common structure exists for these veins to follow. The Sultan Basin consists of continental glacial drift, alpine glacial drift, alluvium and talus. About 14,000 years ago, the Puget Lobe of the Cordilleran ice sheet, which represents the most recent advance of continental ice sheet, flowed into surrounding valleys. The deposits of this glaciation are called the ‘Vashon Drift’ locally. Tongues of the Vashon glacier dammed valleys that were tributaries to the Puget Lowlands, creating large ice dammed lakes. 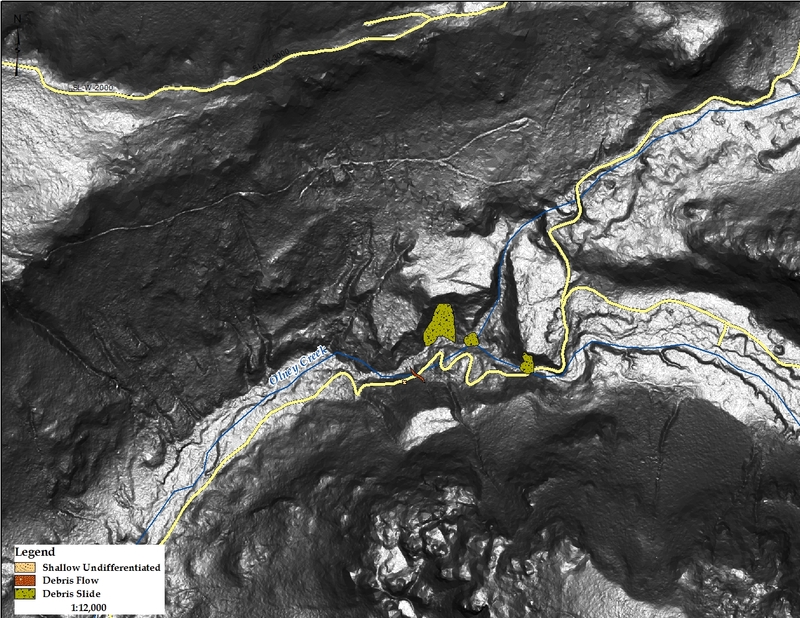 Glaciers advanced up the Pilchuck River system and the Sultan valley, covering the northwestern portion of the watershed (Tabor et al., 1993; Booth, 1990). This blocked the paleo-Pilchuck River, creating a large ice-dammed lake, known as glacial Lake Sultan and depositing outwash (deltas) and lacustrine (lake deposits) on the north flanks of Blue Mountain to Bald Mountain and upstream to midway on the south fork of the Sultan River, Elk Creek and Williamson Creek drainage. This rising lake eventually overflowed, washed over Olney Pass, and deposited fluvial outwash across the plains in the west and south parts of the Sultan River watershed. As the glaciers retreated, the terminal moraine (sediment collected at the end of the glaciers) locally called the ‘Pilchuck Plug’ blocked the upper drainage of the Pilchuck River, creating the new Sultan River watershed (Coombs, 1969; Bliton, 1989). The Sultan River established a channel, rapidly incised into the glacial material, cut into the bedrock, and became entrenched. This incision is probably due to easily eroding glacial material and isostatic rebound of the bedrock in the area. Relict meander bends and channels can be seen near the main channel of the present Sultan River. Alpine glaciation, predominately after the last of the major continental glaciation, formed much of the topography in the upper Sultan Basin. Alpine glaciation deposits make up most of the river valleys (beneath river alluvium). Alpine drift can also be traced up much of the valleys, from Bear Creek to the upper mountain peaks of the Sultan Basin. A steady decline in alpine glaciation has occurred within the watershed and almost all alpine glaciers have disappeared. Currently, only one major glacier northeast of Copper Lake exists. Geologic units within this area have affected general slope stability. 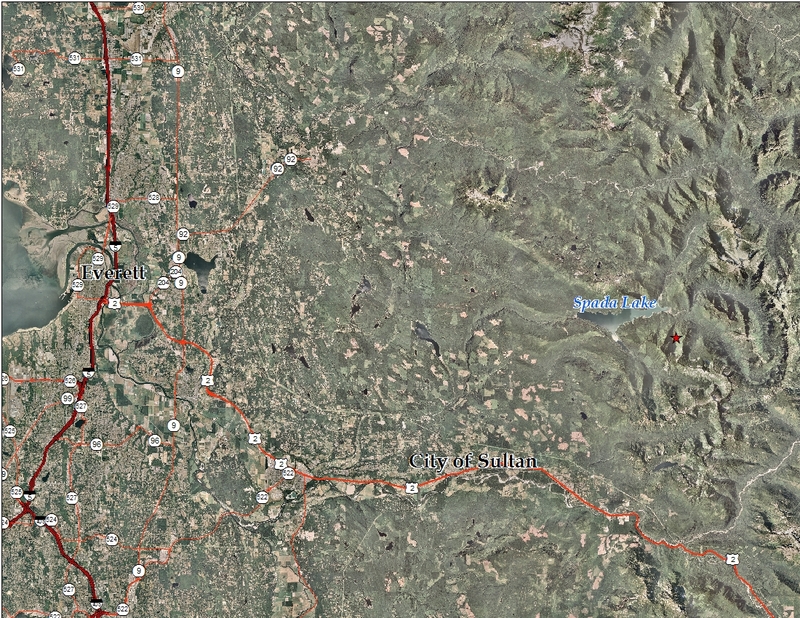 The marine metasedimentary units (including the Stillaguamish Ophiolite suite), present predominately in the southwest section of the watershed, have beds striking between N 5 to W 20 with a variety of dipping beds (due to tightly folded and faulting). This unit has been observed in field and aerial photo interpretation to have a higher landslide frequency, specifically when bedding is near vertical. Historically, hundreds of debris flows have occurred in areas where these geology factors are present. 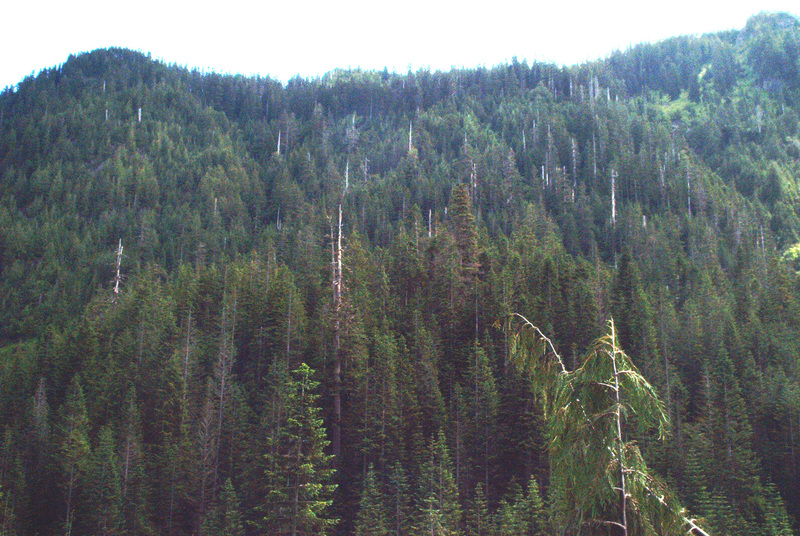 Vertical beds are known to occur near Blue Mountain Ridge, but dips seem to gradually decrease towards the South Fork of the South Fork of the Sultan River. Bedding that is dipping into the mountain or at angles that are not at or near vertical have not been shown to produce landslides, but field verification should be considered in areas where this geology is present. Regional metamorphic units observed within the watershed have not been shown to increase or decrease slope stability within the watershed. These rocks trend along the peaks and ridges along the eastern edge of the watershed, from Hard Pass to Crested Buttes and north to Gothic Peak and Headlee Pass. The beds strike N 15 to W 20 and dip from vertical at Headlee pass, to 35 E near Crested Buttes. These rocks are very resistant to erosion, have a lower landslide activity and can create steep cliffs above the valley (Carithers and Guard, 1945). Altered peridotite and serpentinite (dark green to black rock that feels slippery), although it has not locally been shown to cause slope instability, has created major slope stability issues in other areas (for example, Blewett Pass). These ultramafic rock types occur primarily in a strip north of Red Mountain, 500 to 1,000 feet wide and striking northwest. However, pockets of ultramafic rock can occur throughout the watershed (Tabor et al, 1993). Tonalite (light gray granitic rock) from the Index Batholith and Vesper Stock have caused major rock topples. A prominent feature present within the rock is three strong joint planes. These planes can aid in rocks breaking into rectangular blocks or wedges, as large as 15 feet on each side (Carithers and Guard, 1945). Most rock topples recorded were independent of harvest or road construction and are generated by erosion of the basin. However, two major rock avalanches were located in this area, one dividing upper and lower Greider Lakes, the other west of Vesper Peak. A brief field investigation of these rock avalanche sites has led to the theory that these landslides have been seismically triggered. Both landslides are located adjacent to fault zones. Large regional earthquakes from outside of the watershed could generate major rock topples within this watershed in the future. Bliton, William S., 1989, Sultan River project. IN Galster, R. W., chairman, Engineering geology in Washington: Washington Division of Geology and Earth Resources Bulletin 78, v. I, p. 209-216. Booth, Derek B., 1990, Surficial geologic map of the Skykomish and Snoqualmie Rivers area, Snohomish and King Counties, Washington: U.S. Geological Survey Miscellaneous Investigations Series Map I-1745, 2 sheets, scale 1:50,000, with 22 p. text. Carithers, Ward; Guard, A. K., 1945, Geology and ore deposits of the Sultan Basin, Snohomish County, Washington: Washington Division of Mines and Geology Bulletin 36, 90 p., 1 plate. Coombs, H. A., 1969, Leakage through buried channels: Association of Engineering Geologists Bulletin, v. 6, no. 1, p. 45-52. Cowan, Darrel S., 1985, Structural styles in Mesozoic and Cenozoic mélanges in the western Cordillera of North America: Geological Society of America Bulletin, v. 96, no. 4, p. 451-462. Dragovich, Joe D.; Logan, Robert L.; Schasse, Henry W.; Walsh, Timothy J.; Lingley, William S., Jr.; Norman, David K.; Gerstel, Wendy J.; Lapen, Thomas J.; Schuster, J. Eric; Meyers, Karen D., 2002, Geologic map of Washington–Northwest quadrant: Washington Division of Geology and Earth Resources Geologic Map GM-50, 3 sheets, scale 1:250,000, with 72 p. text. Dungan, M. A., 1974, the origin, emplacement, and metamorphism of the Sultan mafic-ultramafic complex, North Cascades, Snohomish County, Washington: University of Washington Doctor of Philosophy thesis, 227 p., 3 plates. Frizzell, Virgil A., Jr.; Tabor, Rowland W.; Zartman, Robert E.; Blome, Charles D., 1987, Late Mesozoic or early Tertiary mélanges in the western Cascades of Washington. IN Schuster, J. E., editor, Selected papers on the geology of Washington: Washington Division of Geology and Earth Resources Bulletin 77, p. 129-148. Hedderly-Smith, D. A., 1975, Geology of the Sunrise breccia pipe, Sultan Basin, Snohomish County, Washington: University of Washington Master of Science thesis, 60 p., 2 plates. Jett, Guy A., 1986, Sedimentary petrology of the western mélange belt, north Cascade Range, Washington: University of Wyoming Master of Science thesis, 85 p.
Olson, Duane F., 1995, Geology and Geochemistry of the Lockwood Volcanogenic Massive Sulfide Deposit, Snohomish County, Washington: Western Washington University Master of Science thesis, 118 p., 8 plates. Phipps, Richard W.; McKay, Donald T., Jr.; Norman, David K.; Wolff, Fritz E., 2003, Inactive and abandoned mine lands–Spada Lake and Cecile Creek watershed analysis units, Snohomish and Okanogan Counties, Washington: Washington Division of Geology and Earth Resources Open File Report 2003-3, 36 p.
Snohomish County Public Utility District No. 1; Washington Department of Ecology, 1979, Sultan River project, Stage II; Application for amended license, FERC project no. 2157–State of Washington final SEPA EIS and FERC environmental report (exhibit W): Snohomish County Public Utility District No. 1, 2 v.
Tabor, R. W.; Frizzell, V. A., Jr.; Booth, D. B.; Waitt, R. B.; Whetten, J. T.; Zartman, R. E., 1993, Geologic map of the Skykomish River 30- by 60-minute quadrangle, Washington: U.S. Geological Survey Miscellaneous Investigations Series Map I-1963, 1 sheet, scale 1:100,000, with 42 p. text. Wells, Ray E.; Heller, Paul L., 1988, The relative contribution of accretion, shear, and extension to Cenozoic tectonic rotation in the Pacific Northwest: Geological Society of America Bulletin, v. 100, no. 3, p. 325-338. Yeats, R. S., 1964, Crystalline klippen in the Index district, Cascade Range, Washington: Geological Society of America Bulletin, v. 75, no. 6, p. 549-561, 1 plate.